In the late 1800s, Tiedtville had about 200 residents nestled around 100 acres of woods. After the canal workers left the area, Fred developed a picnic area on a wooded grove near the Santa Fe railroad stop. The Santa Fe railroad agreed to make special stops on the weekends, which attracted many city dwellers to the the picnic site. City dwellers would visit for a day or stay in a cabin to fish and hunt. The railroad built two spur tracks: one at the tavern for delivering beer and coal and the other track transporting passengers to the Park. Tiedt expanded the area’s attractions adding a dance hall and bowling alley. The enterprise was lucrative with Tiedt sometimes making $1, 500 to $2,000 a day. (“Where racing is a family affair” by Copper Rollow, Chicago Tribune, May 29, 1986). Using his business acumen, Fred continued to grow his business enterprises. In 1896-97, Fred expanded the picnic grove to include a $6,000 quarter mile track for horse and bicycle races. Horse-drawn land scrapers consisting of sixteen teams of horses built the track which included two grandstands. Initially, farmers raced their horses. 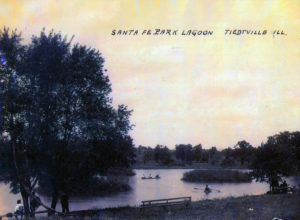 As the picnic grove and race track expanded, they were called Santa Fe Park. During the 1920s, a tornado wiped out the grandstands, and racing was discontinued. (“Where racing is a family affair” by Copper Rollow, Chicago Tribune, May 29, 1986). Fred also continued to build upon the family’s success, and started the annual Farmer’s Harvest Day Picnic. The event began as a way to help local farmers celebrate the end of the harvest. The popularity of the Farmers’ Day Picnic continued well into the 1950s. The Santa Fe Railroad, eventually, canceled its special arrangement with Santa Park due to the rowdiness of the passengers. This, along with the Great Depression, adversely impacted Santa Fe Park. Fred Tiedt and his wife (Amanda Prescott) had four sons: Ralph, Lawrence, Howard, and Emery. When Fred died in 1946, his son Howard took over Santa Fe Park. Exhibiting the same entrepreneurial skills as his father, Howard formed a corporation to rebuild the race tracks–this time capitalizing on the growing popularity of stock car racing. In 1953, the Santa Fe Speedway opened. The Speedway had a quarter and a half mile track with a motor cross course and two grandstands. The track used blue clay from southern Illinois for its surface. Howard added motorcycle races and other promotions such as the Tournament of Destruction and Powder Puff. Howard died in 1990 and his daughter managed the Speedway until it closed in 1995. 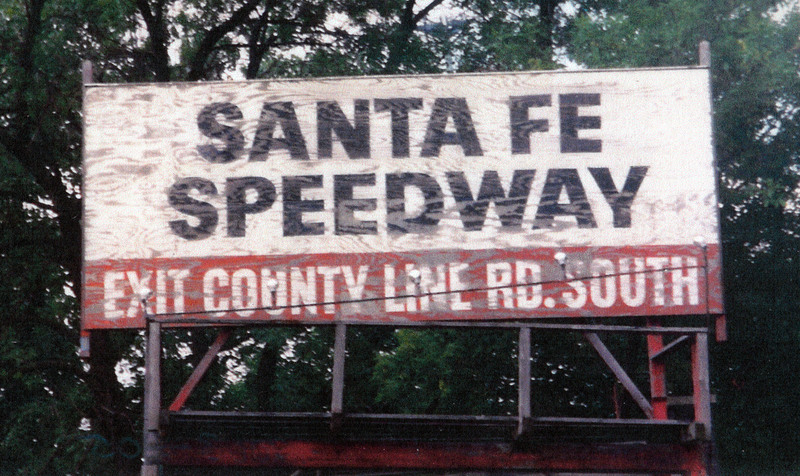 Read Stan Kalwasinski’s history of the Santa Fe Speedway for more information about this popular venue.